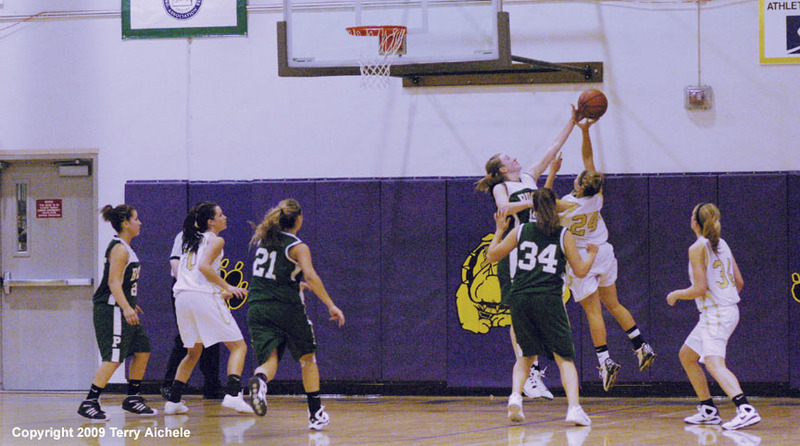 Marie Pedro of Hermiston, in white, drives to the basket while being tightly defended by a Pendleton player. HERMISTON - The Hermiston Lady Bulldogs defeated the Pendleton Bucks in a very physical game on Thursday, January 29, 2009 by a score of 50 to 43. It would be interesting to see how former Dawg Sam McCloud and her new team would match up against former state 5A tournament teammates such as Marie Pedro. The Hermiston gym was rocking as fans of both teams cheered their respective teams. The game started off slow with Hermiston not scoring until the 2:40 mark of the first period. In fact the total score at the end of the first for both teams was only seven points. Alexis Doutre of Pendleton scored first on a freethrow to take a 1-0 lead. Then Angel Williams of the Bucks was fouled on a jump shot and hit the freethrow for a three point play giving Pendleton the 4-0 lead. Hannah Whitsett of Hermiston was fouled and hit both freethrows. Sam McCloud of Pendelton then was fouled and hit one of two freethrows. Pendleton led at the end of the first, 5-2. Both teams picked up the pace in the second period with Hermiston really coming alive to score 15 points to Pendleton's 7 for the period. Kathryn Barnitz of Hermiston was the first scorer in the second period with a jumper. 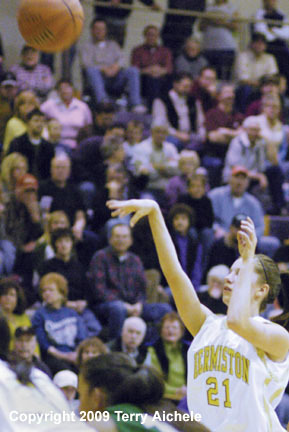 Moments later Barnitz was at the line shooting one for one, hitting both to give Hermiston the one point lead, 6-5. McCloud of Pendleton then went to the line and hit two giving Pendleton the 7-6 lead. Jade Crossley gave Hermiston the lead again on a shot. McCloud went to the line again and hit one to tie it up 8-8. Courtney Walchli of Hermiston then hit a jump shot to take a 10-8 lead with 2:48 to go in the first half. Pendleton never had the lead after that point in the game. Hermiston led at halftime 17-12. Hermiston's Hannah Whitsett scored first in the third period hitting a trey at 6:50. Hermiston scored 12 points during the third and Pendleton scored 10. The game was becoming more physical with both teams racking fouls and time at the foul line. When the dust settled Hermiston led 29 to 22. Hermiston scored 29 in the fourth and Pendleton scored 21. The physical play continued with a player going to the freethrow line on almost every possession. A number of players for both teams were carrying three or four fouls in the fourth. Sam McCloud was one of the Bucks carrying four fouls late in the game. Hermiston had good play from a number of players including Hannah Whitsett, Sami Webb, Jade Crossley, Marie Pedro, Mary Shae Hays, Courtney Walchli, Kathryn Barnitz and Mary Teresa Barnett defending the middle. Pendleton had good performances by Sam McCloud, Angel Williams, Makayla McKay, Alexis Doutre, and Kristen VanCleave. LEFT - Former teammates Sam McCloud and Marie Pedro went all the way to the 5A OSAA basketball finals last spring. This year McCloud plays for Pendleton and Pedro is a starter for the Dawgs. RIGHT - Maloree Moss of Hermiston is closely guarded by Sam McCloud. LEFT - Hannah Whitsett of Hermiston shooting a foul shot in the first half of the game on Thursday. RIGHT - Marie Pedro of Hermiston shoots a jump shot during the first half of the game. LEFT - Mary Shae Hays of Hermiston looks for an open teammate to pass to. RIGHT - Sam McCloud of Pendleton drives to the basket while being closely guarded by Marie Pedro. LEFT - Kathryn Barnitz of Hermiston grabs a rebound in the second half of the game on Thursday. RIGHT - Echo Cougar Bryan Ibarra passes the ball around a Cardinal defender while cornered along the baseline.